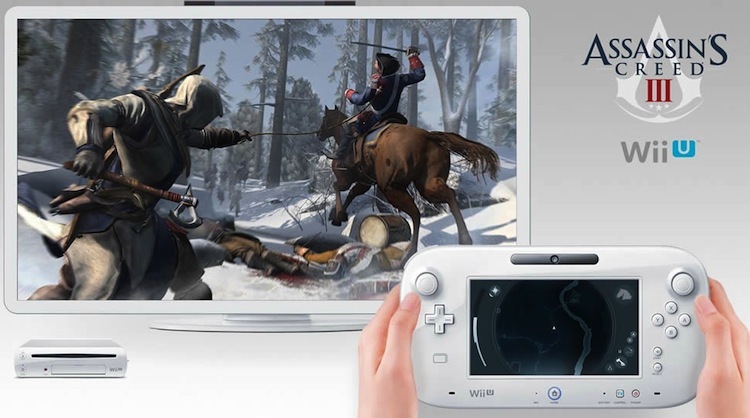 Welcome to the official discussion thread for Assassin's Creed III on the Wii U! To start, please add this game to your log, add it to your collection (if applicable), and (when you are ready) rate it using the link above! Did anyone else pick up this game with their Wii U or plan to? If so, will this be your first Assassin's Creed game? Let us know if you're enjoying it! I've been playing this game with some mixed feelings, but my impressions of the game have gone from 'meh' to 'hey, the game's starting to pick up now, it's actually getting good now.' Keep in mind this is the first Assassin's Creed game I have played! I'm about 2 hours into the game. The game is pretty solid, especially with the stealth killings and blending into the environment, among other things. The game started off a bit slow with the ship sequence, which was basically 5% gameplay and 95% cut scene, or something like that, with some exaggeration. But once I start getting into the game, it's actually great. The game reminds me a lot of Prince of Persia in the way the main character scales buildings and such (it's Ubisoft, no wonder). I'm sure the formula has been refined since the previous AC games. The story is a bit… complicated? Who are all these people? Well, it makes sense that I'm a bit lost, narratively speaking, since I never played the first two games, unless you don't need to know much about those games to follow this one? The game does give a TON of details about every single character and location, which I could spend hours reading up on if I wanted to (I haven't been doing it at this point). I screwed up on the part where you're supposed to jump from the tall building in Boston and land in the hay. I splattered on the street. I didn't get to retry it either, I just re-spawned and continued on! There's stuff like… Franklin's almanac loose pages are nearby! I see them on my map, but I guess they are near the rooftops or something because I can't find it. 'Try again later.' Sure. I've now started struggling with getting 100% of mission objectives. You are encouraged to replay and get 100% to.. 'synchronize memory?' Am I going to miss out on something if I don't? I think they're optional, so I'll press on with the story for now. Oh, and unlike my other Wii U games, this is the only Wii U game that has frozen on me, and it's now twice already! The worst part is the Wii U won't turn off with with even the power button, so I'm forced to pull the plug (UGH, that CAN'T be good). The first time the game froze, I was only about 10 minutes or so into the game. I'm now about 2 hours into the game and it just happened again (fortunately it was just after a save point). Anyway, I really hope the freezing thing doesn't continue. I don't know if freezing was prevalent in the PS3/ Xbox 360 version or if it's a result of porting the game over. I'm really interested in seeing where the game continues to go from here! Oh, and the GamePad: I'm using it so that all the HUD stuff gets moved to the GamePad so that I have a completely uncluttered screen to look at on the TV. It's nice! (Some important actions will display on the TV screen still, though). This is a game that, bare minimum, requires a wikipedia lookup for the entire series prior and youtube videos on how those games start and end. Most, though not all, of the big story beats to get you caught up, are in there. There's a fairly succinct recap at the start of AC3, but it's not quite everything. You don't yet KNOW Desmond, you don't know Ezio and Altair and what they went through. They'll just be names to you. Every single game prior has been building up the metastory about Desmond, and without that knowledge going in it, I imagine, would be insanely easy to get lost. All the AC games start off a bit slow, establishing a new world with new characters, continuing the meta story from where the previous game left off, and reminding players how to play and showing off what is new. The tutorials tend to drag a little bit, but think of it as a time to chill and roll with it. They don't unlock anything additional story-wise. At least, they didn't before, I can't imagine they'd start now. Aside from what I just said, it's mainly to make the not-so-hard missions be a little more challenging for skilled gamers. Am planning on getting this when I get my Wii U. Been waiting to get it on Wii U. Well, I was going to buy this on PS3 to get the bonus content of Assassin's Creed Liberation, but now I might not even bother and go straight to the Wii U port. Nevertheless, I still don't know how it holds up. At any rate by the time I buy a Wii U I should have a good idea. Picked it up on Black Friday. Outside of the massive issues I had in the beginning (character voices were not present in the opening segment, game crashed completely during loading forcing a power off) it's been about par for the course for the series. Haven't gotten to the main character yet so I'm sure it picks up. Hate Revolution era guns. Darn reloads. I actually just started AC2 the other day! I think it's an absurd improvement over the first game. I really couldn't take much more of the first game to be honest. AC2 feels better not just because of the setting and everything, but the gameplay feels more streamlined, especially when it comes to thinks like replaying missions or what have you. Ezio is way more interesting than Altair so far. The game starts off with more of a bang than the first one, so to speak, so you feel like you can get into things easier. Loving it so far. @missypissy If you're using anything besides your hidden blade you're doing it wrong! I played part 1 on my PC for about 30 mins. Didn't like the game, didn't run how I wanted, and the controls (yes, even with controller support) weren't very hot. Didn't care about the other games in the series til 3. Definitely had my strong interest early on and I'm very happy with the Wii U version even if it's not perfect. Loving this game. Though I agree I feel like I'm missing how the game plays (still don't fully get some mechanics) and the back story. Looks fantastic on the gamepad. @carlosrox To be fair, the controller support on the first two games is pretty awful. I had to do some tinkering with it to map it correctly. I still can't use the triggers for some reason. Ezio is way more interesting than Altair so far. The game starts off with more of a bang than the first one, so to speak, so you feel like you can get into things easier. I played the game a bit more yesterday, though I still haven't made it too far yet. I haven't even started using the guy that's on the cover of the game; I'm playing as Haytham. Anyway, sometimes traveling to my next mission on my map takes forever. The world that the game takes place in is massive. So I glance at a FAQ and apparently you can do 'Fast Travel?' Maybe only when going to a previously visited location... or perhaps the game will teach me about this as I play. Is there stuff to do while traveling as I make my way to the next objective? I'm not aware of much in terms of side quests. I also get email notifications while I'm playing, and according to a guy on Miiverse, I can check these by going back to the present as Desmond. But the game never mentions that I can do that, nor the manual, so I'm not sure why I would want to. Again, maybe it's something that will become more apparent later. I did enjoy just going through the Animus database and reading all about the characters and locations; it's all very in-depth and has some nice humor as well! @Xbob42, thanks for the info! OK, I probably should just keep on playing! That's only when you enter into a certain memory. If you don't enter into a memory it is open-world. I think I just don't understand how the game works, I'm play Liberation on the Vita and in that game there will be like 10 minutes of cutscenes and then it will say "follow this dude", but I'm like hey lets go this way instead screw that dweeb, but as soon as I get like 2 blocks away it will say "uh oh buddy, stop right there, desync, error, error, restart! ", it's really annoying because I know if I follow the dude there will just be like 4 more cutscenes and I just want to play the damn game! It's kind of like how GTA blocks you off from certain islands early on. Only, it lasts for what feels like forever. It's because you're meant to be reliving your ancestors memories, so you have to follow their memories as close as possible. Assassin's Creed isn't really supposed to be open-world. Any time you're not in a specific memory, you can roam around freely, sure, and there's things to do... but it's more like one or two big hub towns with a bunch of stuff to do. If you're inside a specific memory (i.e. a story beat) then you need to follow the script, because the whole reason you're there is to find out what happened. Not to go "derrr there's a pretty lady let me go follow her even though I could've done this previously and can still mark that on my map for later!" Loving this game at the moment. Probably my favorite Assassin's Creed so far and Haytham is just plain cool even if he is a templar. My review for this game will be coming in the next couple of weeks so look out for it. I'm having a great time with the game (about 8.5 hrs in). I can't say much about the developing story without spoiling too much for others, but I will say that I'm now on Sequence 6, Memory 1: On Johnson's Trail. I loved commanding the ship at sea, though I didn't really know what a good strategy was for maneuvering so I could get a good aim at the other ships. And how cool that Connor is now wearing the Assassin's robe. I try avoiding the Miiverse community for this game now; people are posting screenshots left and right without spoiler markings. Anyway, back to the game: The massive environments are very impressive, as is the attention to detail. It's a delight to explore the frontier of the United States during that time period, with its impressive forestry and vegetation. It's a very beautiful game. And there are so many side quests, it's easy to get caught up in them and not even get to the next mission objective. Oh, I have watched some Assassin's Creed story videos and read quite a bit on the stories of the prior A.C. games, since I never played any of them. It's all very fascinating, though somewhat complex. It's interesting how the entire series has centered on Desmond in one long continuing story line. Knowing more about those games makes the experience of enjoying A.C. III even better. Man, I really hope Ubisoft can release some of the other AC games on the Wii U so that Nintendo gamers can catch up on what they missed out (a collection would be nice). Oh, does anyone know what's the point of registering with Ubisoft's "U Play" thing? I always skip that screen when I boot up the game. Thanks. With UPlay you can spend points on small add-ons for the game. You get these points by completing certain things ingame so you don't need to worry about spending money on them. Personally I wish all game achievements worked like this.